I was very pleased when Trickett & Webb’s ‘Fly the Tube to New York’ poster was nominated and selected for Poster Art 150 (I abstained from voting on this one!). It’s one of those posters that you have to do a double take and think about.What’s even more interesting is that it almost didn’t happen. The Museum asked us to design a poster in the summer of 2001 to be used in London and New York (a first) to announce the London Transport Exhibition in New York’s Grand Central Station. During our early research we discovered that the London Underground and the New York Subway use identical colours to code lines. 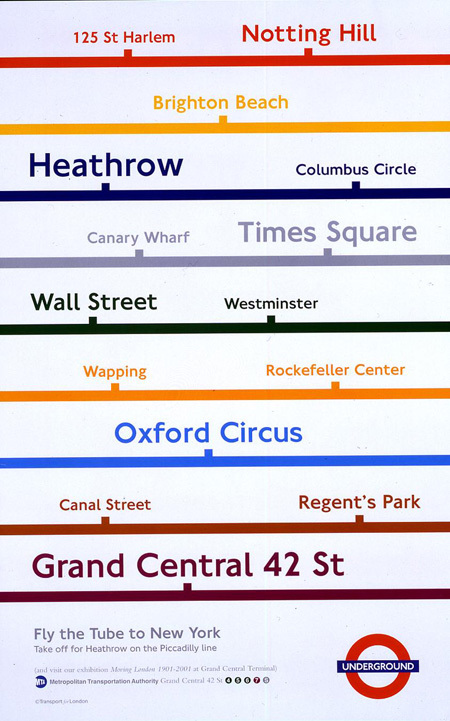 This became the key to the idea: stations on the same line but on different continents, with Heathrow and Grand Central prominently positioned to emphasise the poster’s title ‘Fly the Tube to New York’. The idea was approved and we completed the artwork showing the World Trade Center on the line next to Heathrow. We sent it off in early September 2001. Only a few days later on the 11th the World Trade Center was attacked. After dealing with the initial shock we remembered that we had incorporated the World Trade Center into our poster design and guessed we would hear no more. A couple of days later the MTA (the NY Metropolitan Transit Authority) telephoned to ask us to change the artwork, replacing the reference to the World Trade Center with Columbus Circle, – a traffic intersection in New York and the official point from which all distances from New York City are measured The poster and the exhibition went ahead.